When you are choosing an engagement ring for yourself the most important consideration is that you should absolutely love it, as you will see it on your hand for many years to come. Whilst any ring, if worn on the third finger of the left hand, can act as an engagement ring, the most traditional engagement ring is a single diamond set on top of a simple band. Another traditional engagement ring is three diamonds, with the central stone being larger than the outer two. A three stone ring with a central coloured stone and a diamond set either side is also a traditional choice. A flower-shaped cluster ring, such as the beautiful sapphire and diamond ring Prince Charles gave Diana, is another style which has always been popular as an engagement ring. In days gone by, the stones were almost always set in claws. Claw settings allow much of the stone to be seen and are still a popular choice for many people. There are many alternatives available to the most traditional 6 claw setting. In recent years, the trend has been for stones to be ‘rubover’ set, with the stone being set into a little cup of metal which is pushed up and over the edges of the stone to hold it securely. Stones are also flush set into a ring without projecting at all. These newer styles of setting are very secure and are more practical for people with ‘hands on’ jobs because there are no claws to catch or scratch. Rubover settings can always be cut away at the side for a more delicate look. Rubover and flush setting styles do not affect the sparkle or colour of a diamond. In the same way, the colour of a stone cannot be improved by setting it in fine claws. If you are looking for a ring set with a coloured stone it is important to fall in love with the colour of the stone you choose. Coloured stones come in a wide range of shades. Whilst a deep, royal blue may be the most valuable sapphire colour, you may prefer a paler colour to match your eyes. At Nicholas Wylde we can get a selection of stones in for you to view, allowing you to pick the colour that is just right for you. When choosing an engagement ring, the shape of your hand is an important consideration. A wide band will add width to your fingers whilst a narrow band will elongate them. It is best to set some time aside for a good ‘trying on’ session because, like a pair of shoes, you will recognise the perfect style of ring for you when you put it on. Here at Nicholas Wylde we are more than happy for you to try on a wide range of our engagement rings in your search for the perfect style. The finger size of most of our rings can be altered in our workshop within an hour or so. If you find a ring amongst our stock that is nearly right for you, we can always change the style of the band or the setting of the stones in our workshop downstairs. You can also commission the ring made from a different metal or set with different stones – nearly anything is possible at Nicholas Wylde. 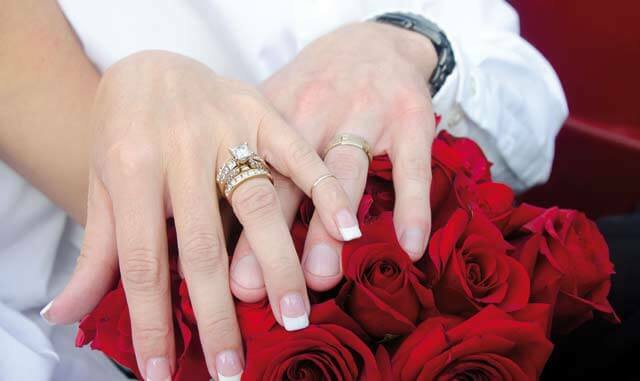 After the engagement comes the wedding, and with the wedding comes another ring to sit alongside the engagement ring. An engagement ring where the stones do not project far from the band means that you can choose a simple straight wedding band and there will not be too much of a gap between the two rings. However, a more unusual shape of engagement ring will mean that a traditional wedding band will not sit up against your ring without a large gap. At Nicholas Wylde, we specialise in designing and hand making wedding bands to fit and compliment existing engagement rings. A wedding band can be made to kink around your engagement ring, a ‘bite’ can be taken out of the wedding band for the engagement ring to slot in, or a piece can be removed from the stone setting of your engagement ring, so that the wedding band nestles neatly alongside the engagement ring. If you have an unusual engagement ring, bring it in to us and we will happily talk you through all the options. If you have decided to buy an engagement ring for somebody without them being involved in the process, it is best to choose a simple, classic single stone diamond design which is sure to be appreciated by most women (as they say, ‘diamonds are a girl’s best friend’). If you think you know her taste in jewellery well, then you can be a little more adventurous. If you do decide to purchase a ring from us and if, when you present the ring you have chosen, you can see that it is not what the lady would have chosen herself, you can bring it back to us and we will give you a credit note for its purchase price. You can use this credit note to buy another ring from our stock or to commission a different style.